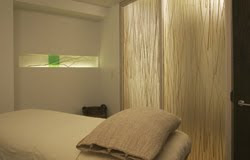 This past Sunday, I headed to Exhale Spa (the Central Park South location) for a facial. My skin was looking the worse for wear, so I decided to do a little something about it! I visited Stella for a 60-minute True Facial, and wow does my skin look amazing now! Most of the facial was standard issue, but the real kicker here was the extractions. Stella made them so painless, I wondered whether she was actually removing all the gunk and dirt from my pores. Imagine my surprise and delight when I looked at my skin afterward and every single pore was clean and tight! Kudos to Stella for an amazing job on the extractions -- I've never had a more attentive facialist who caused less pain. Unfortunately the spa wasn't on my list of favorites overall, though. While I love the Boston location, this one seemed a bit rundown. Rooms were small and, while clean, not as inviting as I'm used to in Boston. The receptionists were also quite short and snippy with me both on arrival and departure, which didn't make me feel too relaxed. For more information on the different Exhale locations or to book an appointment, visit exhalespa.com.